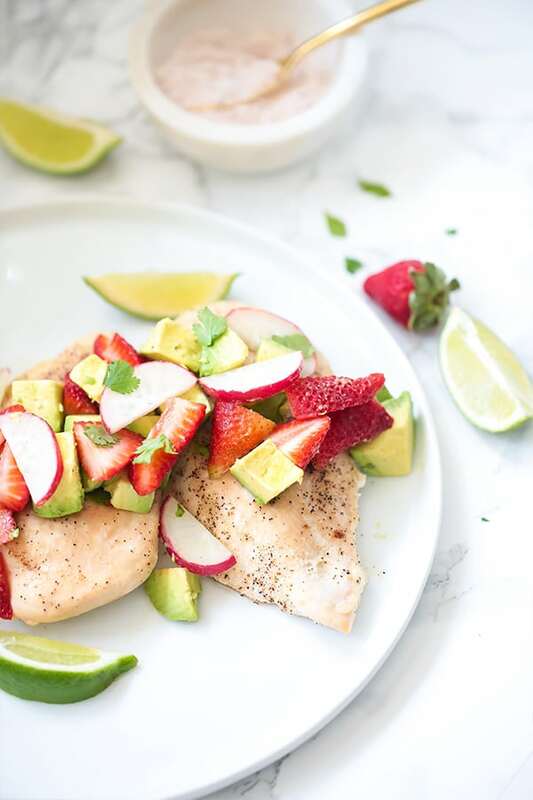 This Baked Chicken with Strawberry Avocado Salsa is the perfect spring dish! It’s paleo, AIP, whole30 and is made with all real food. Strawberry season is one of my absolute favorite parts of spring and summer! Strawberries are just starting to pop up here in Texas, and I can never resist digging when they first start arriving in April. The question is, how do you enjoy them in a fun, unique way? Sure, chocolate covered strawberries are great, and they’re perfect on salads, but having something different to mix it up is always appreciated. 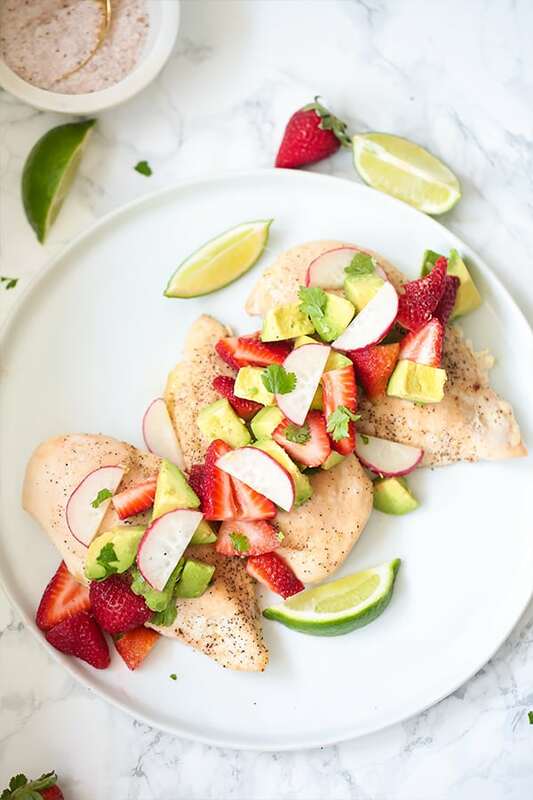 This baked chicken with strawberry salsa is the perfect way to add some flair to strawberry season! This dish is amazing for an easy weeknight meal, or for wowing dinner guests at a gathering! It’s just not something you see every day, but it’s absolutely delicious. It’s paleo, AIP, and whole30 compliant, but no one would know otherwise. Chicken breast is what I used for this dish, but you can easily swap out chicken thigh, or even fish like salmon. The star of the show here! 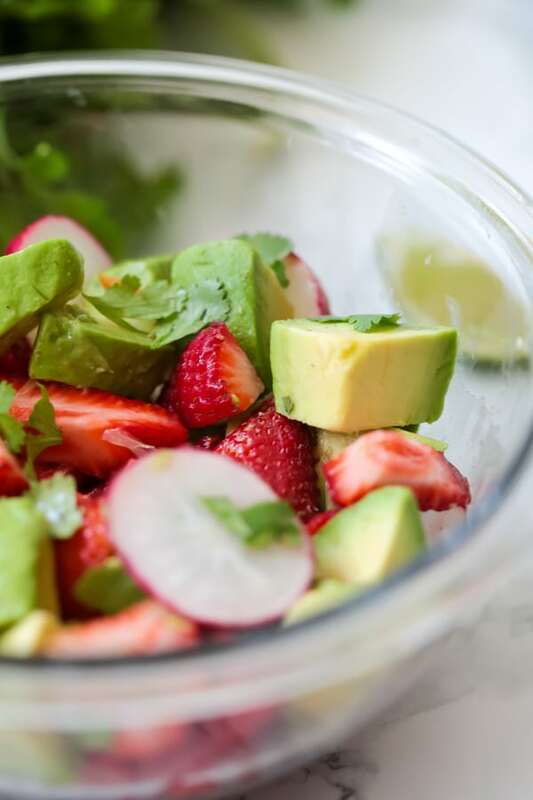 You want to use the prettiest, freshest strawberries you can find for this dish as they take center stage. I used an organic, local variety, but go with what you have.. just make sure it’s tasty as that flavor carries the dish. A great pairing with the berries, and a source of healthy fat for a lower fat cut of meat. This flavor pairs well with the freshness of the salsa. Radishes are one of my secret weapon ingredients for adding a nightshade free spice to dishes! This is for cooking the chicken and enhancing the flavor. Combine all of the ingredients for the salsa in a medium sized bowl. Gently mix and set aside. Lay the chicken breast on the baking sheet and add the avocado oil. Season on both sides. Bake in the oven for 25 minutes (flipping once), or until the internal temperature reaches 165 F.
Remove from the oven and allow to cool and rest for 10 minutes or so. Top with the salsa and serve with a side salad or plantain chips.